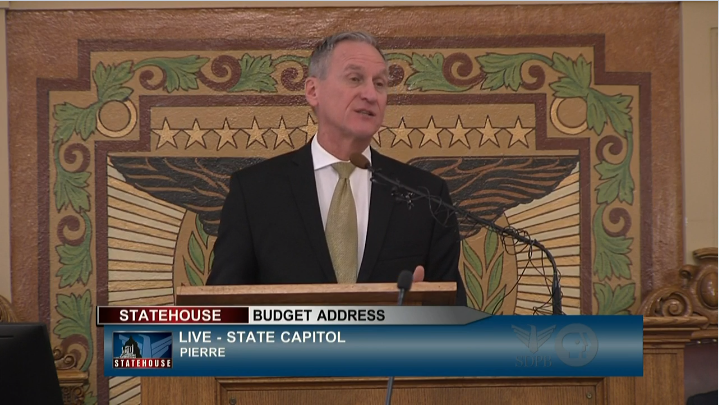 Outgoing Governor Dennis Daugaard is laying out his final budget proposal. In it he calls for increasing state payments to medical providers, schools and state employees. Daugaard’s budget recommendation was a positive one, he says both the economic and revenue outlooks are good. Let’s start there. Daugaard points to increased consumer spending overall in the state, that’s including the ag sector. That means more revenue for state government. He made a point of saying outright, however, that his budget would not include any new sales tax from e-commerce sales, which began in November. Those taxes are being collected for the first time this month. Based on Daugaard’s estimates, however, he says the state could see anywhere from 13 to 23 million dollars in new sales tax collections from e-commerce. Host Lori Walsh: Where does that increase in revenue come from? How does the increase in ag sector spending fare with a recent report from the federal reserve which shows farm bankruptcies on the rise in the 9th district, which includes South Dakota? Daugaard says low commodity prices are causing financial strain on producers, particularly those with modest equity, or those who weren’t around during strong commodity price years. Host Lori Walsh: In Daugaard’s budget recommendation he calls for a 2.3 percent increase in state employee salary increases, medical provider reimbursements and state aid to schools. Let’s start with schools. How is the education association reacting to the budget address? I spoke with Mary McCorkle, who is the president of the South Dakota Education Association, an advocacy group for the state’s teachers. She says the budget address places education interests in a good place and is forward movement for education in the state. McCorkle says the 2.3 percent increase higher than last year. However, she says that figure is a to-be-continued conversation with the incoming Noem administration. Daugaard is also recommending a 2.3 percent increase for state employee pay… How is the State Employees Organization reacting? Eric Ollila is the executive director of South Dakota State Employees Organization. He says its nice to see a proposal for a 2.3 percent across the board raise for state employees, but says it’s disappointing not to see increases also based on employee performance. He says that’s extremely important for state employees. Ollila also made it clear he says he doesn’t see much positive in what he calls paying more for less on the health plan proposals. “I can tell you the most visceral reaction I’ve received from state employees today have been about the proposal to have state employees to pay premiums for a health plan that they have no input into, that they cannot control, that seems to be completely run by legislators and the governor," Ollila says. In order to meet the rising cost of healthcare, Daugaard suggests changing the design of state employee health insurance by--among other things--a statute change to law that prohibits the state from charging its employees a premium. When asked to clarify how that premium would look, Daugaard says it could be a 20 dollar premium for the high deductible plan, and a 40 dollar premium for the low deductible plan. Ollila says the state workers he’s heard from are less than pleased. The healthcare association goes on to say inadequate reimbursement is a primary driver of nursing home closures. They say Medicaid reimbursement for nursing centers is so low, that centers lose an average of 32 dollars a day for each resident paying through Medicaid. The percentage of residents in nursing homes that relies on Medicaid, they say, is 57 percent. Mark Deak is the executive director of the South Dakota Health care Association. He says they’ll work arduously with governor-elect Noem and the legislature to fund long-term care. How are Democrats reacting to the governor’s budget proposal? With some optimism right now. Representative Jamie Smith is the incoming minority leader for the democrats. He says Daugaard’s recommendation on increasing education, health care and state employee pay are shared by the incoming Noem administration. Smith says Democrats still want to see spending on Pre-K education and needs based scholarships. Host Lori Walsh: The unknown, right now, in all of this discussion is how will governor-elect Kristi Noem prioritize her budget. Shortly after the governor’s speech, the Noem camp issued a statement saying balancing the budget is the most important thing… and she doubled down on not raising taxes while hoping to maintain the state’s triple A credit rating. You had a chance to sit down with Governor-elect Noem, were you able to get a sense of her budget priorities? Only in the sense of what you mentioned above. I asked about that 2.3 percent increase figure and here’s what she had to say. “I certainly was a part of that discussion of how we arrived at that 2.3,” Noem says. “Today is his day to talk about his priorities, then in the coming weeks I’ll be able to talk about mine as well. There will be a separate budget address that will happen closer to inauguration, the beginning, sometime during session. So that we have good numbers and we put our thoughts together and prioritized policies that we believe the state should be persuing. It won't be in December. We are still putting together our budget proposal and we will unveil it as soon as we are ready."